This week I've made a lot of realistic looking fake cherry pies. 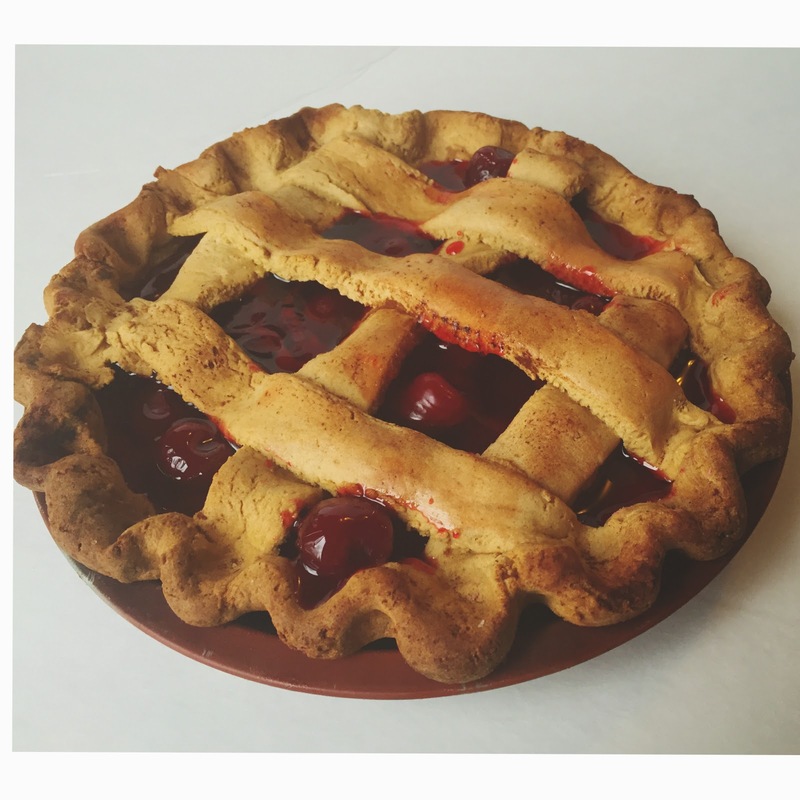 My favorite of the pies I've designed, is the lattice crust cherry pie. When I designed this pie, I wanted to make it look as realistic as one you'd bake to eat, but the challenge was on! Making a pie crust come out with a primitive look is fairly easy because there's a darker, aged look that prim ornaments have. 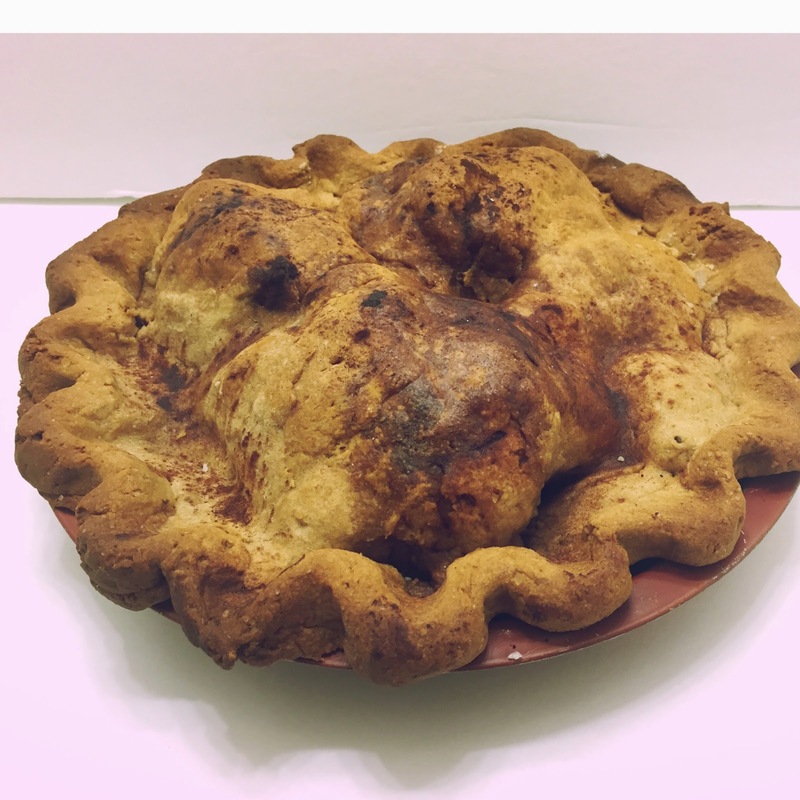 Here's one of the primitive style apple pies that I designed. I wanted it to show lumps and bumps like a real home baked pie, but you can see (below) the darker crust, which gives it more of a primitive style. That's not the look I wanted with the cherry pie. I really wanted it to have a realistic cherry pie look. So in the picture, below, you'll see my model. It's a real cherry pie baked with pastry dough that I made from pastry flour and hand rolled. I then cut the lattice crust, put it together and baked it in the oven. This cherry pie gave me a good model of what I wanted the finished fake farmhouse cherry pie to look like. Plus the real pie gave me a wonderful idea of how to get the fake pie crust shaped. There were many obstacles. See the golden brown crust and the bubbly cherry filling? I knew this would be difficult to achieve because butter is a key element in golden crusts, but I couldn't use butter in a fake crust. When making my fake farmhouse cherry pie, I created a very unique dough that could closely duplicate my real pie. The crust wasn't easy to duplicate. There were so many things about a real crust that just couldn't go into my fake crust, and all of it makes a difference in the end product. After a few times of tweaking, I finally came up with a workable fake pie crust that I was pleased with. So this farmhouse fake cherry pie was born. It has the elements of the baked crust that I wanted with the bubbly cherry filling that makes it cherry pie.